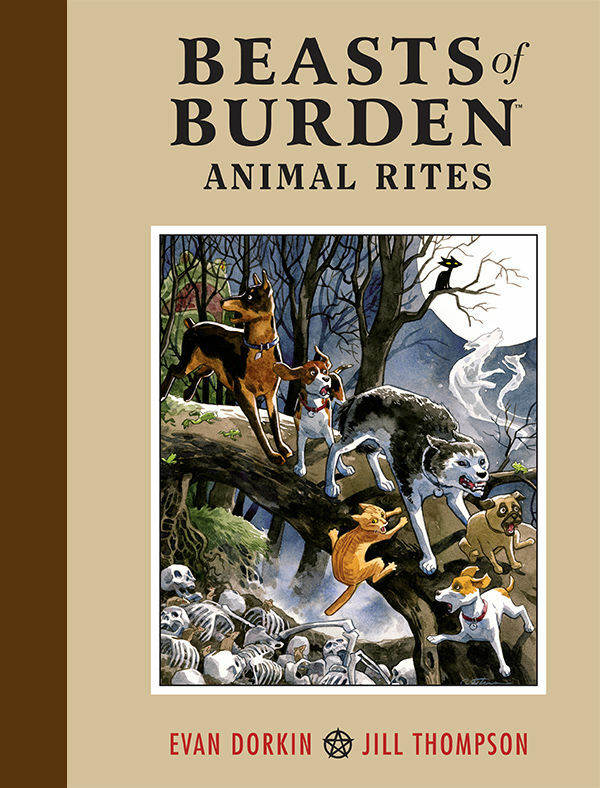 In Animal Rites, the first volume of graphic novel series Beasts of Burden, Pugsley, Jack, Ace, Whitey, Rex, and the Orphan are 5 dogs and a cat living fairly normal lives…until they encounter a ghost in Jack’s doghouse, a coven of witches, a werewolf, and several other supernatural oddities. Eventually, they combat so many paranormal dangers that they are invited to become apprentices of the Wise Dog Society, a group of dogs (and now one cat) devoted to defending their territory from paranormal threats. This description might lead one to think that the story illustrated in the pages of this book is a fun little happy-go-lucky read. I mean, it’s got talking animals in it, right? True, Beasts of Burden is a talking animal story. But it is not a talking animal story that you want to show your little siblings. Not unless you want them to grow up traumatized, anyway. In which case, go for it. You will succeed dramatically. This series is billed as horror mystery. It fits that genre quite nicely, and with more originality and skill than many entries in the genre. One would expect a story like the one in the description—the adventures of a bunch of canine paranormal investigators—to be illustrated in a rather fun, cartoony style, and possibly to show up as a Nickelodeon series sometime in the near future. Instead of that rather trite approach, readers are instead given lavish watercolor illustrations to gaze at, not of anthropomorphic, but realistically-rendered creatures, with some liberties taken to allow for facial expression. The art in this book is marvelously expressive, and gorgeous to skim. Whether it remains so upon a closer look is entirely up to the individual reader, as the art of this book puts the “gore” in “gorgeous.” If you are the sort of animal lover who cries when you see cute puppies in sad situations, you may as well steer clear, because this book will leave you traumatized, too. And if you are a curious animal lover, but iffy about the animal horror content, let me present you with this image from the third story: a pack of zombie dogs getting run over by a truck in vivid, splattery detail, then being left in the road because the drivers don’t want to handle the hassle of cleanup and owner contact. If that makes you uncomfortable, you might as well stay away, too, because the horror only gets worse from there. And for horror readers, this is a treat. Before you think me an absolutely heartless person for saying so, let me say that I’m the sort of animal lover who can’t go to a pet shop without wanting to adopt all the cats, and then coming up with a list of sad things that might happen to those cats should I not adopt them, and then leaving the pet shop sad because I already have enough cats and they don’t want any friends anyway. So I am a fan of animals. However, I am also a fan of well-done horror, and this book is definitely that. Any artist can illustrate lots of blood and gore and call it horror, but only a skilled artist can make the reader care about the characters that it’s happening to, which is the key to the success of this volume. This book is great horror not because it’s disgusting (which it is) but because it has an emotionally wrenching effect on the reader, largely fueled by the art and its careful juxtaposition of the mundane with the horrible, as well as its well-designed, emotionally sensitive panel progressions. This level of artistry is makes the work one worth appreciating, perhaps even admiring. Animal Rites, then, is a graphic novel best appreciated by lovers of well-executed horror, and by readers who can stomach animal tragedy. Everyone else will probably find it too sad or gross to read. Due to the genuinely graphic nature of this graphic novel, I don’t recommend it for younger teens, even precocious ones. Older teens and above who are looking for an intelligent and affecting horror experience, though, will find a rewarding read in this. Note: Holo Writing is a participant in the Amazon Services LLC Associates Program and, as such, may earn a small commission from any product purchased through an affiliate link on this blog.